One followed by 28 zeros. A very large number. See also: Lilavati Definitions for more large numbers. Nahuta: ... a vast number, a myriad Sn 677; J I.25, 83; Pv IV.17; DhA I.88; PvA 22, 265. A measure of years. See also: Lilavati Definitions for more large numbers. Asankheyya: (adj.) [a + sankheyya, grd. of san-khya] incalculable, innumerable, nt. an immense period A II.142; Miln 232 (cattari a. ), 289 DhA I.5, 83, 104. A unit of quantity often referenced in the Suttas (more often in the Jatakas), equal to 107 or 10 million. The lakh or lac: a measure of quantity, equal to 100,000.
kotippakoti, nahutam, ninnahutam, akkhohini, bindu, abbudam, nirabbudam, ahaham, ababam, atatam, sogandhikam, uppalam, kumudam, pundarikam, padumam, kathanam, mahakathanam, asankheyyam. A coin described as square, made of copper or silver and possibly of gold weighing about 146 grains. Today (7.14.2011) the 1903 GBP = US$ $3067.87039. Two Pounds, 2 Shillings (or 2 Guineas) GBP in 1903 had the purchasing power of about A150.36 GBP today. 1 pound = 20 shillings. Today (Tuesday, April 01, 2003 12:02 PM - PM London Gold Fix: 334.35/oz) a gold kahapann would be worth @ $111.50; a silver k. @ $1.47; and a copper K. @ $0.015. [Updated July 14, 2011, 3:26 AM - AM London Gold Fix: $1592.50/oz; a gold kahapana would be worth $531.07; silver $13.12; copper @ $0.088. Masa3 [identical with masa2] a small coin ( = masaka) J II.425 (satta masa = s. masaka C.). Masaka [fr. masa2+ka = masa3] lit. a small bean, used as a standard of weight and value; hence a small coin of very low value. Of copper, wood and lac (DhsA 318; cp. KhA 37; jatu-, daru-, loha-); the suvanna- (golden m.) at J IV.107 reminds of the "gold" in fairy tales. That its worth is next to nothing is seen from the descending progression of coins at DhA III.108 = VvA 77, which, beginning with kahapana, addha-pada, places masaka and kahanika next to mudha "gratis." It only "counts" when it amounts to 5 masakas. - Vin III.47, 67; IV.226 (panca-); J I.112 (addha-masakam na agghati is worth nothing); IV.107; V.135 (first a rain of flowers, then of masakas, then kahapanas); DhA II.29 (panca-m.-mattam a sum of 5 m.); PvA 282 (m+addha- half-pennies and farthings, as children's pocket-money). Kakana (nt.) [ka (for kad-) + kana = less than a particle] a coin of very small value Sdhp 514. Kakanika (f.) = prec. J I.120, 419; VI.346; DA I.212; DhA I.391; VvA 77 = DhA III.108. From the latter passages its monetary value in the opinion of the Commentator may be guessed at as being 1/8 of a kahapana; it occurs here in a descending line where each succeeding coin marks half the value of the preceding one, viz., kahapana, addha, pada, masaka, kakanika, upon which follows mudha "for nothing." -agghanaka "not even a farthing's worth," worth next to nothing J VI.346. See also: Lilavati Definitions for more on the weight of these coins. Derived from an ancient Celtic unit and adopted by the Romans as the leuga, the league became a common unit of measurement throughout western Europe. It was intended to represent, roughly, the distance a person could walk in an hour. The Celtic unit seems to have been rather short (about 1.5 Roman miles, which is roughly 1.4 statute miles or 2275 meters), but the unit grew longer over time. In many cases it was equal to 3 miles, using whatever version of the mile was current. At sea, the league was most often equal to 3 nautical miles, which is 1/20 degree , 3.45 statute miles, or exactly 5556 meters. In the U.S. and Britain, standard practice is to define the league to be 3 statute miles (about 4828.03 meters) on land or 3 nautical miles at sea. See also: Lilavati Definitions for more on the Yojana and measures of distance. Yoke6: OED: One-fourth of a suling, about 50 or 60 acres (cf. oxgang as 1/8 of a plough-land); hence, later, applied vaguely to small manors. (Cf. yoklet.) Kent. A measure of distance: about 1/4 of a Yojana, or 1-3/4 miles. A measure of length: the distance between the tip of the forefinger to the end of the elbow. A measure of length: the distance between the tip of the little finger to the tip of the thumb with the fingers stretched wide. A measure of length: the distance of the width of four "men's" fingers about 3" later taken to be the width of the hand at the palm: (but now exactly) 4". A measure of volume: A twelve-edged [solid] with width, length, and height measured by one hasta is called a cubic hasta. In the case of grain and so forth, a measure [equal to] a cubic hasta is called in treatises a "Magadha kharika". Which, for purposes of measureing the length of a kappa is reconed to hold approximately: 103,959,025 sesame seeds. 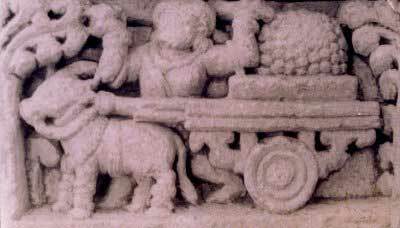 Dona [Sanskrit drona (nt.) conn. with *dere*o tree, wood, wooden, see dabbi and daru and cp. Sanskrit druni pail] a wooden pail, vat, trough; usually as measure of capacity (4 alhaka generally) Pv IV.333 (mitani sukhadukkhani donehi pitakehi). tandula- a dona of rice DhA III.264; IV.15. At J II.367 dona is used elliptically for donamapaka (see below). -paka of which a d. full is cooked, a dona measure of food S I.81; DhA II.8. Brown University, Department of Mathematics, History of Mathematics, See: Lilavati Definitions. On the Mashaka we have something: (From: Early Monetary Systems of Lanka (Ceylon))Some rock inscriptions refer to a relationship between money and weights. The famous 'Vessagiri' inscription refers to an instance where King Dappula V(l0th Century A.D.) paid or agreed to pay by means of 'kalan' and 'aka' for the construction of a dagoba. The following table of weights as given in the `Abhidhanappadipika', a book written in the 12th Century A.D. may be considered as relevant. Dvi [Sanskrit dvi, dva etc. - Bases: I. dvi = Sanskrit dvi in dvipad = Latin bipes (from d*ipes), Ags. twifete; dvidant = bidens. Reduced to di (see B I.4) as in Gr. di\pous ( = dipad), Latin diennium and preference dis- (cp. Goth. twis asunder, Ogh. zwisk between). - II. du ( = dvi in reduced grade, cp. Latin du-plex, dubius etc.). - III. dva (and dva) = Sanskrit dvau, dva, f. nt. dve (declined as dual, but the Pali (plural) inflexion from base I. see B I.1); Gr. du/w, Latin duo; Oir. dau, da, f. di; Goth. twai, f. twos; Ags. twa ( = E. two); Ohg. zwene, zwo zwei. Also in cpd. num. dva-dasha twelve = Gr. d(*v)w/Qeka = Latin duodecim. ] number two. A. Meanings-I. Two as unit: 1. with objective foundation: (a) denoting a combination (pair, couple) or a repetition (twice). In this conn. frequent both objective and impersonal in mentioning natural pairs as well as psychologically contrasted notions. E. g. dvipad (biped), nagassa dve danta (elephants' tusks), cakkhuni (eyes); dvija (bird), duvija (tooth), dijivha (snake). See also dutiya and dvaya. - dve: kama, khidda, gatiyo (Sn 1001), danani (It 98), piya, phalani (Sn 896; It 39), mitta, sineha etc. See Nd2 under dve, cp. A I.47 100; D III.212-214. - (b) denoting a separation (in two, twofold etc. ): see dvidha and compounds - 2. with symbolic, sentimental meaning: (a) only two (i. e. next to one or "next to nothing"), cp. the two mites of the widow (Mark XII. 42), two sons of Rachel (Gen. 30): dumasika not more than 2 months (Vin II.107); dvemasiko gabbho (Pv I.67); dvevacika; duvangula (see below). - (b) a few-more than one, some, a couple (often intermediate between 1 and 3, denoting more than once, or a comparatively long, rather long, but not like 3 a very long time): masadvayam a couple of months; dvisahassa dipa 2000 islands ( = a large number); diyaddhasata 150 = very long etc. ; dvihatiha (2 or 3 = a couple of days) q. v.; dvirattatiratta (id. of nights); dvisu tisu manussesu to some people (PvA 47); dvatikkhattum soveral times; cp. dvikkhattum (more than once), dutiyam (for the 2nd time). II. Two as unit in connection with its own and other decimals means a complex plus a pair, which amounts to the same as a large and a small unit, or so to speak "a year and a day." E. g. 12 (sometimes, but rarely = 10+2, see sep.); - 32: rests usually on 4 X 8, but as No. of the Mahapurisa-lakkhanani it denotes 30+2 = the great circle plus the decisive (invisible) pair; - 62: views of heresy: see ditthi; also as a year of eternity = 60 kappas+2; - 92: as measure of eternity = 90+2 kappas = a year and a day. III. Number twelve. 1. Based on natural phenomena it denotes the solar year (dvadasamasako sanvaccharo VvA 247). - 2. Connected with the solar cult it is used with human arrangements to raise them to the level of heavenly ones and to impart to them a superior significance. Thus: (a) as denoting a set (cp. 12 months 12 companions of the Sun) it is the No. of a respectful, holy, venerable group (cp. 12 sons of Jacob Gen. 35, 22; cakes as shewbread Lev. 25, 5; stones erected Josh. 4, 8; apostles Math. 10, 2; patriarchs Acts 7, 8; companions of Odysseus Hom. Od. 9, 195; Knights of Arthur etc. ): of theras, accompd by 12 bhikkhus PvA 67, 141. 179 etc. ; dvadasa kotisatani Sn 677; five groups of 12 musicians VvA 96 (cp. 5 X 12 cromlechs in the outer circle of Stonehenge). - (b) as measure of distance in space and time it implies vast extent, great importance, a climax, divine symmetry etc. 12 yojanas wide extends the radiance VvA 16; 12 y. as respectful distance PvA 137 (cp. 2000 cubits in same sense at Josh. 3, 4); 12 y. in extent (height, breadth and length) are the heavenly palaces of the Vimana-petas or Yakkhas Vv 551; J VI.116; VvA 6, 217, 244, 291, 298 etc. In the same connection we freq. find the No. 16: solasa-yojanikam kanaka-vimanam Vv 671; VvA 188, 289 etc. - Of years: J III.80; VvA 157 (dvadasa-vassika; in this sense also 16 instead of 12: so'asa-vassuddesika VvA 259 etc. See so'asa). 1. numeral dve (and duve) two: nom. acc. dve (Sn p. 107; It 98; J I.150; IV.137 etc.) and (in verse) duve (Sn 896, 1001); gen. dat. dvinnam (It 39, 40, 98; J II.154); instr. dvihi (J I.87: v. l. dihi; 151; II.153); loc. dvisu (J I.203; PvA 47) and duvesu (Vv 412). -rattatiratta two or three nights Vin IV.16; also in dviha two days (q. v.). -ja (cp. dija) "growing again" i. e. a tooth J V.156. -padaka = -pad Th 1, 453 = Sn 205. -sattaratta twice seven nights, a fortnight [cp. Sanskrit dvisapta] J VI.230. - See also der. from numer. adv. dvidha, viz. dvejjha (and dejjha), dvedha-, dve'haka. 6. as noun-derivation dvaya a dyad (q. v.). -vidha twofold, instr. duvidhena M III.45 sq. ; etc. - Derivations from du- see sep. under duka (dyad), dutiya (the second), and the contamination forms dubha (to) and dubhaya (for ubha and ubhaya). -yojanika J I.125; IV.499; dvavisati (22) VvA 139; dvattimsa (32) Kh II. (-akara the 32 constituents of the body); DhA II.88; VvA 39 etc. ; dvacattalisa (42) Nd2 15; Vism 82; dvasatthi (Nd2 271III. and dvatthi (62) D I.54; S III.211; DA I.162); dvanavuti (92) PvA 19, 21. - Note. A singular case of dva as adv. = twice is in dva-ham Sn 1116. Nalika (f.) [Sanskrit nadika andnalika] a stalk, shaft; a tube, pipe or cylinder for holding anything; a small measure of capacity Vin II.116 (suci-, cp. sucighara, needle-case); D I.7 ( = bhesajja- DA I.89); A I.210; J I.123 (tandula- a na'i full of rice); VI.366 (addha-n-matta); Nd2 229. Cp. pa-. -odana a na'i measure of boiled rice S I.82; DhA IV.17; -gabbha an (inner) room of tubular shape Vin II.152. Navutika (adj.) [from navuti] 90 years old J III.395 (-a itthi); SnA 172. Pattha2 [cp. late Sanskrit prastha] a Prastha (certain measure of capacity) = 1/4 of an a'haka; a cooking utensil containing one Prastha DhA II.154; SnA 476 (cattaro pattha a'hakam). Paddha2 (adj.) [cp. Sanskrit prardha] half (*) J III.95 (probably = paddha1, but C. explinations as addha upaddha). RATHARENU (m.), A very minute measure of weight, a mite (Ab. 194). RATANAM, ... There is a measure of length called ratanam, equivuleut to the hattha or cubit (two vidatthis}; it must be the Sanskrit (Ab. 196, 268; Alw, 1. 76). At Mah. 128 the reading is I think ratanattayassa ratanattam, the precioussness of the Three Gems. Ammanam. According to Childers, A Dictionary of the Pali Language this would be about eight thousand acres. Karisa (nt.) a square measure of land, being that space on which a karisa of seed can be sown (Tamil karisa), see Rhys Davids, Ancient Coins and Measures of Ceylon, p. 18; J I.94, 212; IV.233, 276; VvA 64. "Nikkha." Nikkho is a variable weight, equal to 250 phalas, which we may call grains. Xuanzang born Chen Hui or Chen Yi, was a Chinese Buddhist monk, scholar, traveler, and translator who described the interaction between China and India in the early Tang Dynasty. Time: Khano va layo va muhutto va; the Chinese traveller, Hiuen Tsiang (or Yuan Chwang), has the following note on these periods: The shortest portion of time is called a kshana; 120 kshanas make a takshana; 60 of these make a lava (sic); 30 of these make a muhurta; 5	of	these make a kala; 6 of these make a day and night. Beal's Records 71. See Childers, muhutto. Likkha (f.) [*Sanskrit lik.sa egg of a louse, as measure equal to 8 trasarenu (BR.). - Connected with Latin ricinus a kind of vermin (see Walde, Latin Wtb. s. v.)] a kind of measure VbhA 343 (36 rattarenus equal to one likkha, 7 likkhas equal to 1 uka); KhA 43 (-matta). Tigavuta: about six miles. Equal to three Magadhan village fields. [AN 5.100 n.5]. Childers: Three Leagues. PED: Gavuta (nt.) [cp. Vedic gavyuti pasture land, district] a linear measure, a quarter of a yojana = 80 usabhas, a little less than two miles, a league J I.57, 59; II.209; Vism. 118; DhA. I.396. From: Sacred Books of the East, Volume 7, The Institutes of Visnu, translated by Julius Jolly, 1880; #4: Weights and Measures, p. 23, I IV. 1. The (very small mote of) dust which may be discerned in a sun-beam passing through a lattice is called trasarenu (trembling dust). 2. Eight of these (trasarenus) are equal to a nit. 3. Three of the latter are equal to a black mustard-seed. 4. Three of these last are equal to a white mustard-seed. 5. Six of these are equal to a barley-corn. 6. Three of these equal a Krishnala. 7. Five of these equal a Mâsha. 8. Twelve of these are equal to half an Aksha. 9. The weight of half an Aksha, with four Mâshas added to it, is called a Suvarna. 10. Four Suvarnas make a Nishka. 11. Two Krishnalas of equal weight are equal to one Mâshaka of silver. 12. Sixteen of these are equal to a Dharana (of silver). 13. A Karsha (or eighty Raktikâs) of copper is called Kârshâpana. 14. Two hundred and fifty (copper) Panas are declared to be the first (or lowest) amercement, five hundred are considered as the middlemost, and a thousand as the highest.